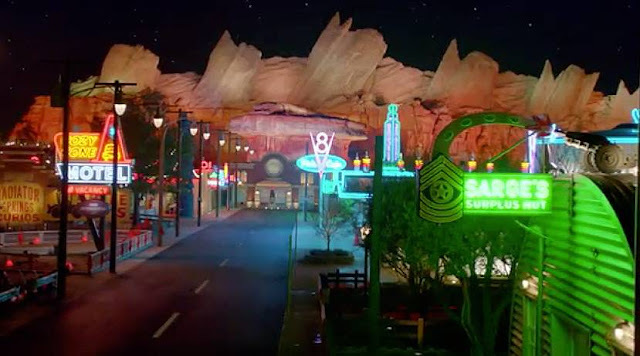 "When Cars Land opened Walt Disney World executives came at DCA to have a tour as at the time they were planning to bring Cars Land for WDW with a version that would have included Radiator Springs Racers but a completely indoor version. Disney World Cars Land would have gone in Disney's Hollywood studios and taken over where Toy Story Land sits now as well as possibly the animation courtyard area. They were going to have the Cars Land street with no Luigi’s Flying Tires but they would have make Mater's Junkyard Jamboree and the indoor version of Radiator Springs Racers would have been the only part of the ride. They said they won't build the mountain range at DHS. It would have been a short version of Radiator Springs Racers and I’m not even sure if they would have used the Test Track vehicle as well. It was going to happen, though, and what changed it was when they started getting Star Wars and Marvel that changed the whole direction of the park. I guess you could say Toy Story Land is the reason why because it’s a hell of a lot cheaper and faster to pump out during this time when DHS is in need of something new considering half of it is closed." 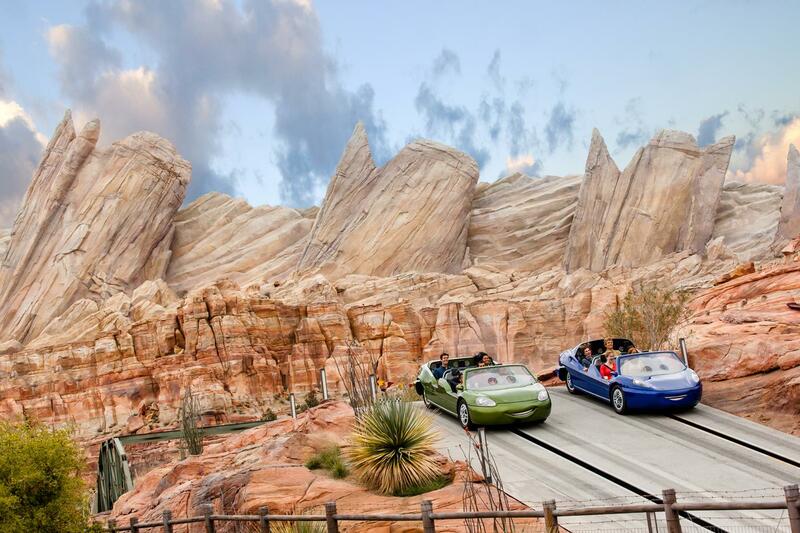 But DHS Cars Land was not the only Cars Land "that never was" as "Tokyo Disney executives also got a tour of Cars Land in 2014 and back at that time they loved two things: they wanted Soaring over California and they were obsessed with Cars Land. The location where they were planning to build it at TDR I’m not too sure with, but they're currently building Soaring and the planned Cars Land never happened, probably because they choose others expansions." Too bad for DHS and TDR of course, and at first my guess was that Cars Land didn't happen at DHS because the outdoor race track would have taken too much room and they don’t have that much land at DHS. Or because they already have Test Track at Epcot nearby. So, i tried to learn a bit more and in fact a variety of options were discussed for DHS Cars Land but with no serious layouts of any kind. The main option they were apparently discussing was an indoor version, including the race part, and it was for reasons due to heavy rain downpour as it happen often in Florida during the rain season ( you might find this strange as it didn't stopped them to build Test Track with an outdoor track but may be they've learned from it ). Basically, it seems that they were looking at ways to trim the budget down, especially all the rockwork, but it still fundamentally would have been Radiator Springs, otherwise there was no point in doing a Cars Land. And, yes, of course the pressure to serve Star Wars and Marvel edged out Cars Land Radiator Springs. So, i was wondering if they plan to bring a Cars Land at DLP DHS - and this is a big "IF" - if they are thinking to do it like it was planned for WDW DHS, i.e with a Cars Land main street, a smaller mountain range, eventually a B-Ticket attraction for kids like Mater's Junkyard Jamboree - or moving the "Cars Quatre Roues Rallye" currently in front of Crush's Coaster to the new land, and for the big attraction having Radiator Springs Racer with the race track, all indoor. Not only for weather reasons but also to save money as if the race track is outdoor it requires to build the same huge mountain range they did at California Adventure. Having the race part indoor would certainly require a huge show building but on the other hand, as the current indoor part of Radiator Springs Racer is happening at night time, then having the race track all indoor would mean that the race part too will have a night lighting. Which could not only be fun but also provide an interesting lighting experience! Will they do it? I suppose that the future will tell us what happen! I remember reading about the rumor of Cars Land in Tokyo Disneyland. If I remember correctly, they were talking about taking out the Rivers of America section of Westernland. It sounds crazy, but that's what the rumor was at the time!